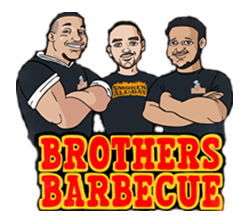 Brothers Barbecue is about authenticity. The smells of smoke that hit your nose once you open the doors will let you know you have arrived in the right place.We specialize in freshly smoked meats daily such as pulled pork, ribs, brisket, chicken & sausage. The brick and wood interior all while listening to the sounds of smooth jazz, classic rock & blues music lend to an atmosphere that is only surpassed by its great food, incredible cornbread, and southern-style sweet tea. Entrees like brothers brisket, ribs, and chopped BBQ are some of our favorites as well as sides, including collard greens, mac n cheese and candied yams. Gavin, Jamie, and Chris Farella grew up in the Hudson Valley, but they learned Eastern Carolina barbecue during summers with their family in Beaufort, N.C., and through the cooking talents of their mother, Cheryll Farella, who owned a restaurant in London and taught Jamie and Chris to cook. Those influences, and a road trip sampling barbecue from Kansas City to Texas, helped them develop their own recipes. They bring that flavor to the smoker at Brothers Barbecue in New Windsor.